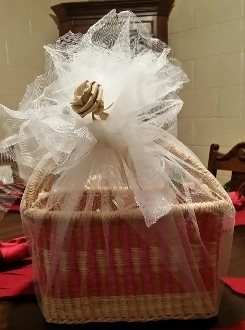 Amazing Gift Basket! A Rivergrass Bread Basket filled with 1-2lb bag/Charleston Gold Rice; 1-7oz bottle/Gullah Luv Seasoning; 1-7 oz bottle/Hot Luv Seasoning; 1 Palmetto Rose; 1-16oz jar/Sweet Potao Butter; 1-5oz jar/ Hot Pear Chutney. Made by women in the village of Bolgatanga (W. Africa). 7x10. Holds a full loaf of bread (or memories ) when products are gone. Colors and designs vary. Wrapped in Tulle.